Esther Houghton was born on March 7, 1803 in Waterford, Oxford County, Maine. Esther died on March 31, 1803 in Waterford, Oxford County, Maine, of fits. John Wesley Houghton, The Houghton Genealogy. Descendants of Ralph and John Houghton, , at http://www.archive.org/stream/houghtongenealog00houg . New York: Frederick H. Hitchcock Pub. Co., (1912) , p. 372. Harriet H. Houghton was born on July 21, 1804 in Waterford, Oxford County, Maine. Harriet died on September 3, 1804 in Waterford, Oxford County, Maine. "Maine Births and Christenings, 1739-1900," database, FamilySearch (https://familysearch.org/ark:/61903/1:1:F4SZ-DTY : 4 December 2014), Henry Houghton, 05 Dec 1791; citing Waterford, Oxford, Maine; FHL microfilm 12,625. He was the son of Capt. Luther Houghton. He lived with his father till he was twenty-one years of age, and was educated in the common schools. In 1862 he went to Boston to learn the baker's trade, but stayed only three months enlisted in the Sixth Massachusetts regiment, a nine months' organization, raised in Lowell. He served his term of enlistment and returned to Waterford, where he was drafted, but did not go into the service. He was again drafted at the next conscription, and that time sent a substitute. About 1865 he became a clerk of William Deering in Portland, who at that time was manufacturing cloth for the government to make into soldiers' uniforms. After leaving that place he was a clerk for the Eatern Express Company, in the fall of 1866 became a teamster for Haines & Smith. Henry Luther Houghton lived at Bowdoin Street, Portland, Cumberland County, Maine. John Wesley Houghton, The Houghton Genealogy. 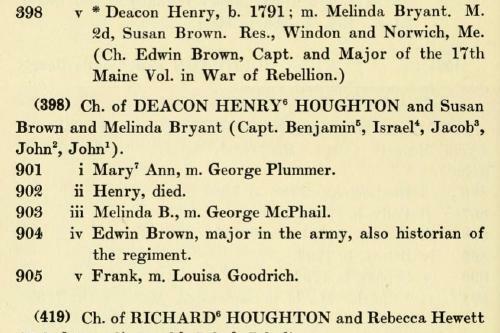 Descendants of Ralph and John Houghton, , at http://www.archive.org/stream/houghtongenealog00houg . New York: Frederick H. Hitchcock Pub. Co., (1912) , p. 430. 1900 United States. Census Office. 12th census, 1900 population census schedules, Washington, District of Columbia: Bureau of the Census Micro-Film Laboratory, ([197-]) , Maine; Roll: T623 ; Enumeration District: 72; Sheet 14B; line 71, dwl 36-245-290. Marshall L. McClanahan, John & Beatrix (Joselyn) Houghton of Lancaster, Massachusetts, Seal Beach, Calif.: (1973) , p. 172A, 195. Deacon Jonathan Houghton was born on June 14, 1786 in Harvard, Massachusetts. Jonathan married Tirzah Flint on August 10, 1812 in Waterford, Oxford County, Maine. Jonathan died on December 30, 1862 in Waterford, Oxford County, Maine, at age 76. 1850 United States. Census Office. 7th census, Population schedules of the seventh census of the United States, 1850, Washington, District of Columbia: National Archives. Central Plains Region, (1964) , Census Place: Waterford, Sweden and Denmark, Oxford, Maine; Roll: M432_262; Page: 178B; Image: 348. Find A Grave Memorial# 74150999. On January 21, 1822, He married secondly, Mary Bryant of Waterford, on 21 Jan 1822 in Waterford, by whom he had no additional children..
Thomas W. Baldwin, Vital records of Harvard, Massachusetts to the year 1850, Boston: Wright & Potter, (1917) , p. 63. 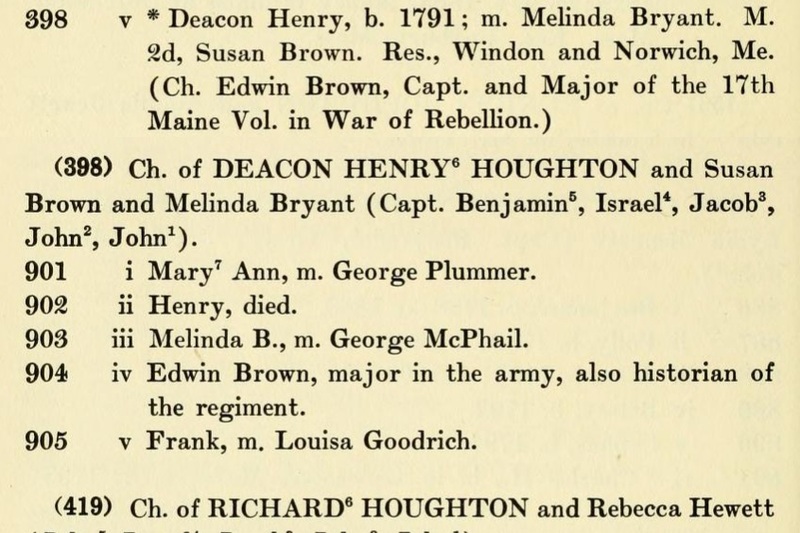 Unknown author, Houghton Genealogy (n.p. : n.pub., unknown publish date), p. 342. Find A Grave Memorial# 73255962. 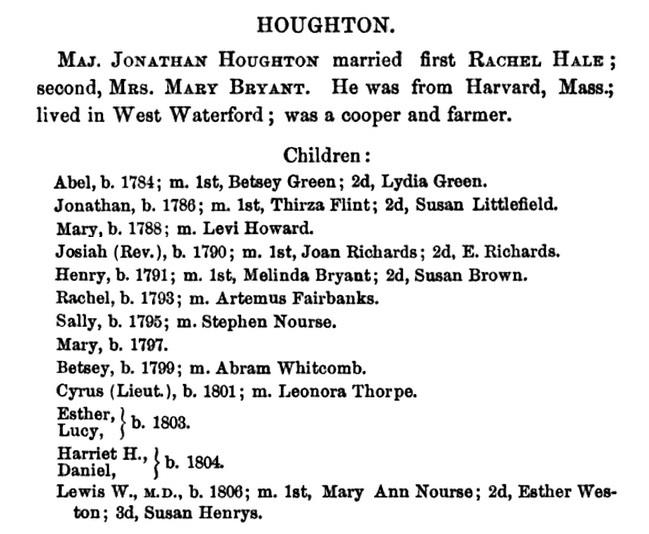 "Maine Births and Christenings, 1739-1900," database, FamilySearch (https://familysearch.org/ark:/61903/1:1:F4SZ-DT5 : 4 December 2014), Josiah Houghton, 16 Mar 1790; citing Waterford, Oxford, Maine; FHL microfilm 12,625. He was buried in Highland Cemetery, Newburyport, Massachusetts. "Massachusetts, Town Clerk, Vital and Town Records, 1626-2001," database with images, FamilySearch (https://familysearch.org/ark:/61903/1:1:Q29G-G9GB : 13 July 2016), Josiah Merrill Houghton, 17 Feb 1829; citing Death, , 154, town clerk offices, Massachusetts; FHL microfilm 890,256. Find A Grave Memorial# 7415093. Lewis married Mary Ann Nourse on June 8, 1833 in Waterford, Oxford County, Maine, as his first wife. General Catalogue of Bowdoin College and the Medical School of Maine ... 1794/1889, , at https://books.google.com/books?id=O2jOAAAAMAAJ . Brunswick Maine: Published by the College, (1889) , p.98. Find A Grave Memorial# 73306582. Louisa Houghton was born on September 10, 1814 in Waterford, Oxford County, Maine. She was the daughter of Deacon Jonathan Houghton and Tirzah Flint. Louisa died in November, 1856 in Waterford, Oxford County, Maine, at age 42. Lucy Houghton was born on March 7, 1803 in Waterford, Oxford County, Maine. Lucy died on March 26, 1803 in Waterford, Oxford County, Maine, of fits.